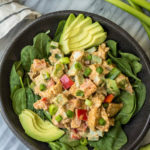 This easy taco chicken salad is a family friendly paleo recipe that only takes 15 minutes to whip together. No cooking needed! It’s a great Whole30 salad for meal prep or Whole30 side dish for any event!